Greenways are inspiring a whole new wave of casual cyclists — with Waterford’s stunning 46km trail just the latest example. Here’s my checklist from a recent trip. Unless you live locally, or make a habit of packing bikes, don’t bother bringing yours. A €20/€10 hire includes helmets and locks. For €45, electric bikes are an option for the less fit or able (or lazy). Shuttles can drop and collect riders along the route, too. See waterfordgreenwaybikehire.com and thegreenwayman.com for hire. A helmet, water, snacks and fully charged phone are essential. Bring a light backpack, rain jacket and layers to whip on and off as you go. A viaduct along the Waterford Greenway, Ireland's longest off-road walking and cycling experience. 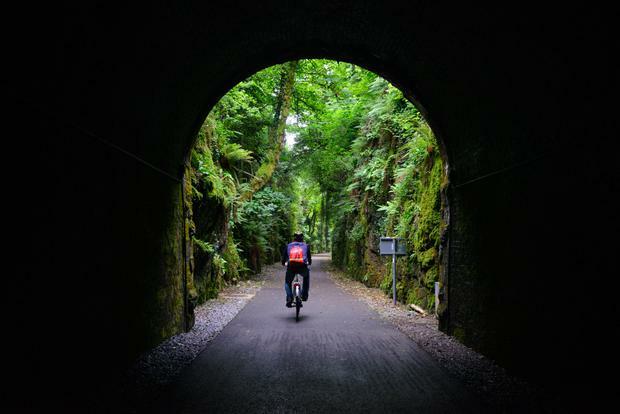 A cyclist on the Waterford Greenway. Fair-weather cyclist? Double up with a padded saddle. You’ll thank me later. As with Mayo’s Great Western Greenway, the wind is deceptive. Don’t be the eejit with a face like smoked salmon at dinner. 46km is a fair old cycle for anyone who doesn’t spend Saturdays in Lycra. Be realistic about your fitness and ability — and your children’s too. Instead of the full greenway, why not try a section? The 10km from Dungarvan to Durrow is a stunner. As a general rule, cycle on the left, pass on the right, and don’t be shy about using your bell. (it's hard to hear cyclists approaching from behind). The Waterford & Suir Valley Railway (wsvrailway.ie), Mount Congreve Gardens (mountcongreve.com), Coach House Coffee and O’Mahony’s pub (see below) are possibilities. Think of a greenway cycle as touring, not a training spin. “Kilmacthomas is on a high,” Stephen Lynch, one of the local owners of Coach House Coffee (coachhousecoffee.ie), told me. 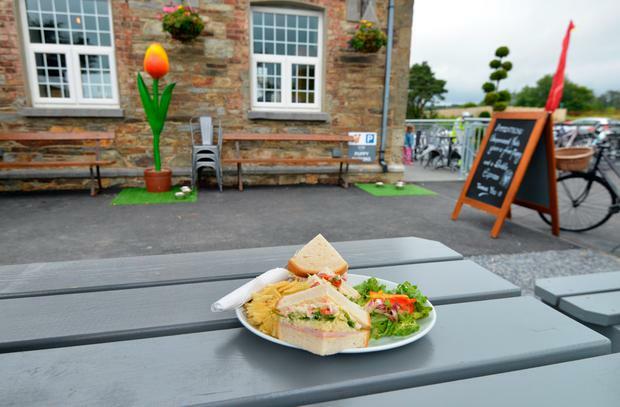 Set in a historic Famine workhouse blooming with flowers, the café opened in March and features heaps of Waterford goodies on its menus — from floury blaas and Barron’s Bakery bread to O’Reilly’s sausages (the locals’ choice) and Flahavan’s porridge and flapjacks. First to vanish from the daily dessert cabinet? The homemade gluten-free brownies and carrot cake... make sure you beat the peloton to it! O’Mahony’s is a haiku of a hostelry in Durrow. 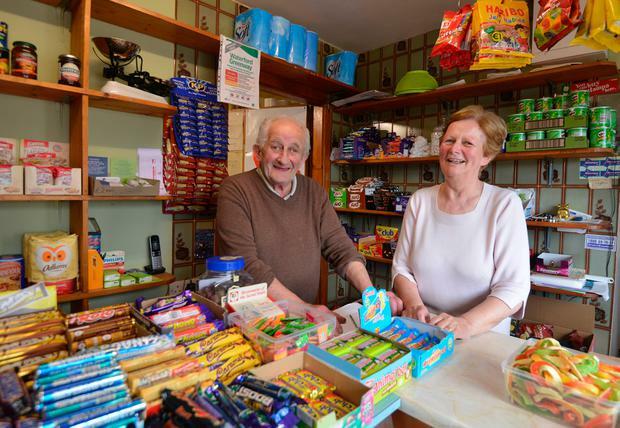 Run by Tom and Helen O’Mahony (above), who have become unlikely Greenway celebs, it’s a pub dripping in nostalgia — from black and white railway photos to the old-school welcome (“When you’re here, you’re home,” they told me). Tom once took the Great Southern and Western Railway trains to school (they ceased operation in 1967), providing a living link with the Victorian tunnel and Ballyvoyle viaduct nearby. If you stop off, pop into the adjoining Siopa Beag... time travel never tasted so sweet. Don't stop at the greenway. Waterford may not feature on the Wild Atlantic Greenway (it starts/ends at Kinsale), but the Copper Coast (coppercoastgeopark.com) is one of the sweetest stretches of coastline in Ireland. Drive from Dungarvan to Tramore, soaking up the sea stacks, old copper mining husks and pretty villages like Annestown and Stradbally along the way. 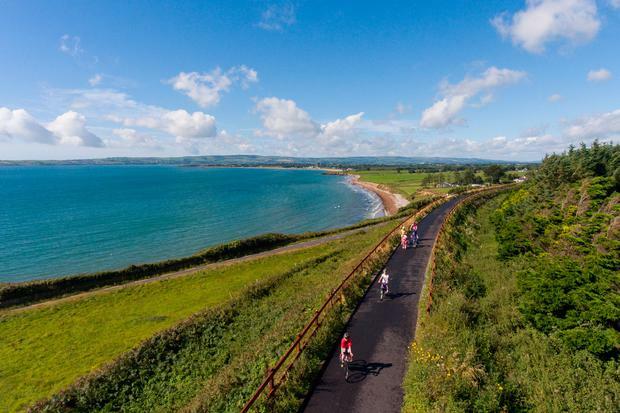 7 Amazing Cycles in Ireland: Fresh air for every fitness level!